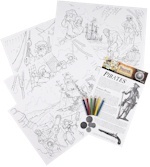 The Pirate Colouring Posters consists of four A3 size colouring sheets, an educational information sheet and six colouring pencils. There is a colourful header card and all are held in a clear cellophane bag. On the front of the posters are the images with the themes of the pirate Blackbeard, pirate attack, a lucky escape, buried treasure. The educational information sheet has a number of pirate relate images together with the history of pirates, famous pirates and pirate life and there is also a crossword to complete. A full colour A4 Battle of Britain air attack scene with a set of rub down transfers. The back of the card has an image to colour in and educational information. A full colour A4 Viking attack scene with a set of rub down transfers. The back of the card has an image to colour in and educational information. A full colour A4 Roman forum scene with a set of rub down transfers. The back of the card has an image to colour in and educational information. A set of 4 colouring postcards with Viking images on the front and a postcard design on the reverse with educational information. Each pack is supplied with 6 pencils.